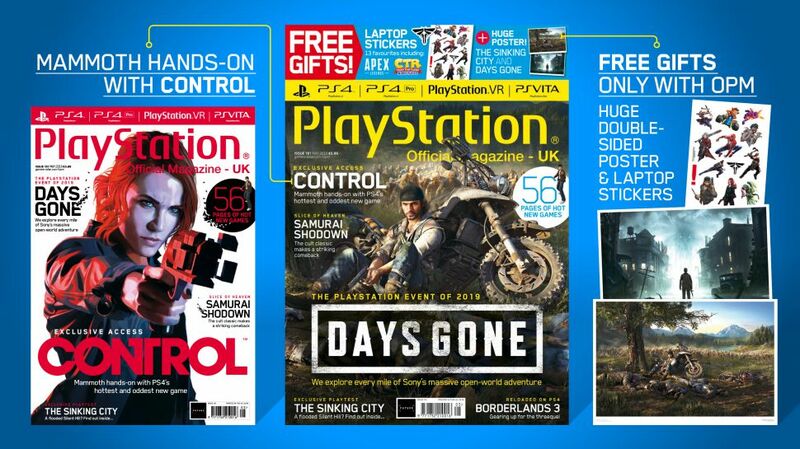 Last week, GamesRadar announced the latest issue of the Official PlayStation Magazine (#161) which features hands-on impressions with highly anticipated games including Days Gone, The Sinking City, and Control. For the issue, Jesse Faden will also be on the cover, in a gorgeous new piece of artwork! For their latest issue, the writers took a tour of the Remedy offices, met with a number of developers from the Control team, and spent the day checking out the studio's latest adventure. While readers will have to check out the article for their full impressions of their demo, the team did reveal that their "exclusive hands-on with the game suggests the developer is going to win over PS4 players this summer when Control releases." For fans in the UK, while Remedy's lead may be on the cover, if you're buying the issue in stores, keep an eye out for the Days Gone slipcase which has the magazine plus laptop stickers and a double-sided poster (featuring Days Gone and The Sinking City) inside. Issue #161 goes on sale, available in both print and digital editions, on Tuesday 9th April 2019.